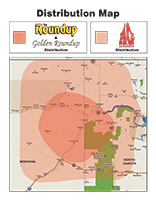 To place a display advertisement in The Roundup, Ag Roundup or Golden Roundup please contact Dianne or Laurie at The Roundup office Monday 8 AM to 5 PM, Tuesday – Friday 9 AM to 5 PM. Weekly Roundup Edition – Noon every Friday, Publishes every Wednesday. Monthly Ag Roundup Edition – Deadline is the last Tuesday of every month, publishes the first Wednesday of every month. Monthly Golden Roundup – Deadline is the Wednesday prior to the 15th of every month, publishes on the Wednesday closest to the 15th of every month. Please contact us to verify exact dates when placing ads.